The fall was caused by falling demand especially from abroad. The latest data adds to fears that the slump is worsening despite Beijing's efforts to protect the economy. The official figure, from the China Federation of Logistics and Purchasing, is likely to prompt further worries of more substantial job losses. Thousands of factories have closed as a result of the sharp drop in orders - prompting fears that employment worries could lead to unrest. China's President Hu Jintao has warned that the global financial crisis is hitting the country's competitiveness. 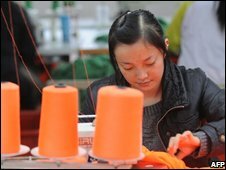 China's economic growth is expected to fall to about 9% in 2008 from 11.9% in 2007 while this year it is forecast to be as low as 6%.